These facts about St Patrick’s day surprised even us. It is less than a week away from the big day on the 17th March. It is always amazing to see just how many people celebrate across the world. This year we have an epic rugby match against England on St Patrick’s day which I am sure the entire population of Ireland will be eagerly watching. Our Facebook group for Irish around the world has had some crazy arguments over people calling it Patty’s day. If you are not a member yet sign up here. It is believed St. Patrick, a Roman-Britain-born Christian missionary, was born in the late fourth century and is credited with bringing Christianity to the Irish people. It is also believed St. Patrick drove all the snakes out of Ireland. However, post-glacial Ireland never actually had snakes. Many believe that the term “snakes” referred to the serpent symbolism of the Druids of that time and place. Today, there are no snakes to be found! The first St. Patrick’s Day parade was held in New York City in 1762. Since 1762, 250,000 marchers have traipsed up Fifth Avenue on foot – the parade still doesn’t allow floats, cars, or other modern trappings. According to Irish legend, the St Patrick used the three-leafed plant as a metaphor for the Holy Trinity when he was first introducing Christianity to Ireland. Guinness sales soar on St. Patrick’s Day. On St. Patrick’s Day the average amount of Guinness that is consumed is doubled around the world. Since 1962, the Chicago River is dyed kelly green during the celebration. Forty tons of dye is dumped into the river which changes colour for four to five hours. For most of the 17th century, Saint Patrick’s Day was considered a strictly religious holiday in Ireland, which meant that the nation’s pubs were closed for business on March 17. In 1970, the day was converted to a national holiday, and the stout resumed flowing. 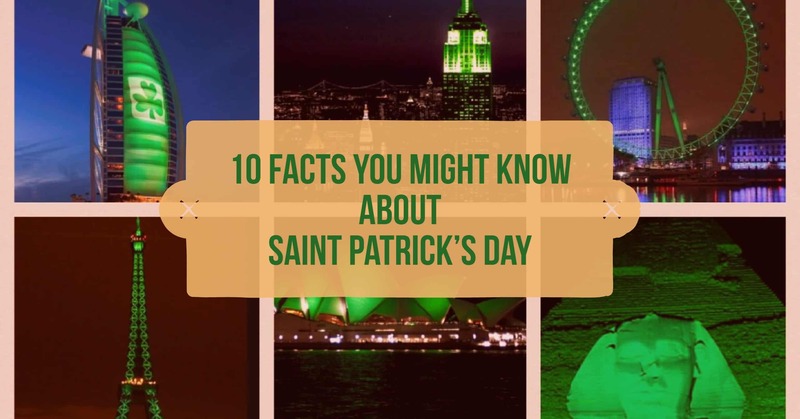 What other facts about St Patrick’s day do you know? Comment below and be sure to share this article with a fellow Irish person around the world. Have a great day on March 17th! It is also a great time to order an Ancestry DNA kit to trace your Irish heritage. Get up to 30% off the DNA kits here. Happy St Patrick’s Day celebrations to my Irish Brady Family in Dublin. Slainte Maria Brady Panmure Auckland New Zealand. Go geasfor Le Chiele Sinn Aris, go geoinni Dea Imbois a laimhe thu. (Until we meet again may God hold you in the palm of his hand. Up Tyrone!